The Senate Judiciary Committee hearings for Attorney General nominee William Barr have focused heavily on Barr's views on Special Counsel Robert Mueller. 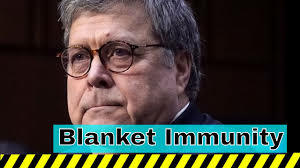 But nobody is asking about Barr's legal crusade for blanket immunity for federal agents who killed American citizens. Barr received a routine questionnaire from the Judiciary Committee asking him to disclose his past work including pro bono activities "serving the disadvantaged." The "disadvantaged" that Barr spent the most time helping was an FBI agent who slayed an Idaho mother holding her baby in 1992. Barr spent two weeks organizing former Attorneys General and others to support "an FBI sniper in defending against criminal charges in connection with the Ruby Ridge incident." Barr also "assisted in framing legal arguments advanced… in the district court and the subsequent appeal to the Ninth Circuit," he told the committee. That charitable work (for an FBI agent who already had a federally-paid law firm defending him) helped tamp down one of the biggest scandals during Barr's time as Attorney General from 1991 to early 1993. Barr was responsible for both the U.S. Marshals Service and the Federal Bureau of Investigation, two federal agencies whose misconduct at Ruby Ridge "helped to weaken the bond of trust that must exist between ordinary Americans and our law enforcement agencies," according to a 1995 Senate Judiciary Committee report. After Randy Weaver, an outspoken white separatist living on a mountaintop in northern Idaho, was entrapped by an undercover federal agent, U.S. marshals trespassed on Weaver's land and killed his 14-year-old son, Sammy. The following day, FBI sniper Lon Horiuchi killed his wife, Vicki, as she was standing in the cabin doorway. Horiuchi had previously shot Randy Weaver in the back after he stepped out of the cabin. The suspects were never given a warning or a chance to surrender and had taken no action against FBI agents. Weaver survived.